The automatic bread slicer -without pusher lever- E. Gabarro, represents the last technological generation in bread slicers. The advance and setback of the pusher is made automatically. Its pressure on the bread is regulable according with your requirements thought a frequency variator. It is used by frontal side, so that it can be perfectly suitable for the shop furniture. Easy and perfect way of working, becasue the movements of the pusher are fast. Best machine fo all type of bread, silent working with a perfect and right slicing because of its incidency with inclination of the bread on the blades. They are made and have finished of hight quality. Designed according with all the security and hygiene norms. The TPA is the distinguished machine that combines perfectly comfort and production. Thickness of the slice to choice. 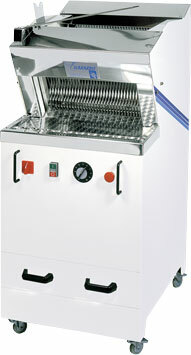 This machine it is made in three different versions of 43, 53 and 60 cm. 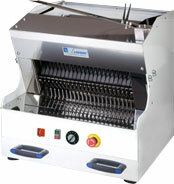 According to the slicer’s zone width, which permit slice up breads which their maximum length is 40, 50 and 60 cm.